A fracture is any kind of break in the bone. The fingers are made up of 3 bones; the thumb has 2. The individual bones are called phalanges. Ligaments connect the individual bones by bridging across the joints between the individual bones. Any trauma to the fingers, including falls, twists, crush injury and direct blows can lead to fractures of the finger phalanges and/or injuries to the ligaments between them. Patients may experience pain, swelling and bruising in the fingers. There maybe difficulty making a fist. On examining the hand there may be a rotated appearance of the affected finger, which may result in difficulty making a full fist. In a ligament injury there maybe excessive movement at the joint. The first step is to undergo a consultation, involving a medical history and clinical examination. Mr Naqui may organise further tests such as an x-ray or MRI scan. X-rays help to identify the pattern of any fracture(s). MRI scans can help visualise any associated ligament injury along with any fracture. Treatment will depend on the type of injury. The goal of treatment is to give you a hand that can perform its daily functional activities and grip well, without pain or stiffness. 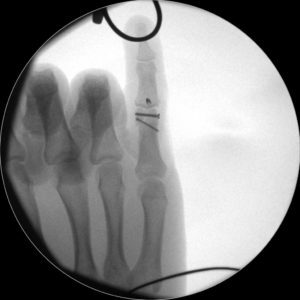 Phalangeal fractures which have little displacement or rotation are usually treated conservatively by splintage. Regular x-rays will help monitor the progress over the course of a 4 to 6 week period. There is generally a good prognosis with restoration of normal function. A key consideration is trying to prevent finger stiffness. Rotated and displaced fractures, multiple fractures or fractures which involve the joints may require surgery. This is followed by hand therapy to regain and maintain good finger function and grip. Ligament injuries will be assessed for stability. If the joint is unstable, they may need operative fixation. Surgery may be performed under local, regional or general anaesthetic and is generally a day case procedure meaning that you will be able to go home the same day. The fracture pattern will dictate the surgical method. Methods include fracture manipulation (turning or changing the position of the fractured bone) and splint immobilisation, the addition of small wires for a temporary period or opening the fracture and using a small plate and screws. Each method has its special indications, its advantages and disadvantages. Mr Naqui will go through these options with you in detail before agreeing a course of action. The finger will be placed in a splint following the surgery for around 4 weeks. There may be no splint if the bone has been fixed with a plate. Any sutures inserted will be removed at around 10 days after surgery. Mr. Naqui and the hand therapist will then provide you with specific exercises to perform to regain normal movements of the hand. Fractures take around 6 weeks to heal on average. Bones in the hand usually heal faster. Contact sports should be avoided for 3 months. Mr. Naqui will discuss with you regarding return to sports depending upon your particular sport as splints could be worn to get you back quicker. Driving can safely be resumed at around 6 weeks. Return to work is dependent on the nature of you work but usually expected within 2 weeks if it is non-manual work. You can discuss this with Mr Naqui at your consultation. The main potential complications that will be discussed with your prior to gaining consent for surgery include pain, swelling, infection, stiffness, scarring, numbness and occasionally non-union (non healing of the fracture). Pain and swelling are common following surgery, these should settle after a few days with simple painkillers. Infection is rare. Stiffness at the joint should resolve if you follow the exercise programme as advised by Mr Naqui and the hand therapist following surgery. Injury to nerves around the hand may occur during surgery and lead to a feeling of numbness. In a small proportion of patients healing of the fracture does not occur. If this were to happen then there are further surgical options, which you can discuss with Mr Naqui.